Adrik has many issues. What he is saying on this page is extremely biased based on a few run ins and should not be taken as the whole truth (especially in regards to religion). The Soldiers of Hope as an organization is not religiously/spiritually affiliated in any way. The individual member’s beliefs are varied across a wide spectrum as they are united by a shared disdain for all things Demi. Unfortunately, Adrik’s bias prevents him from sharing the much more relevant to Fae’s situation reason that she should use “gods” and not “god” in her speech; he just doesn’t see it as the bigger threat to Fae. 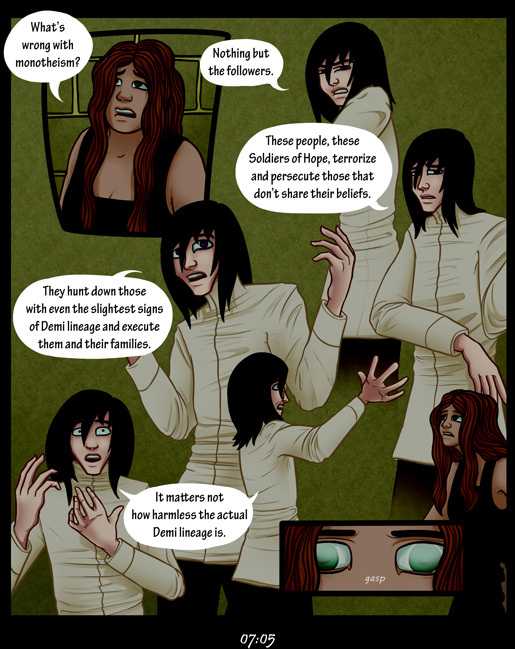 I had a ton of fun with this page because Adrik tends to let his emotions control him a lot more than he would ever admit. Plus, he’s a hand talker (especially when his emotional state has the reigns), so I get to practice a ton of expressions and exaggerated body language at the same time. Hi, I'm afraid you posted the wrong page here. I really like your comic btw. Thank you for pointing that out! :) It'll be fixed soonish. How embarrassing!